Now here’s something I’ve wanted to do forever. I keep meaning to make brownies with a peanut butter swirl on top, but I just hadn’t gotten around to it yet. 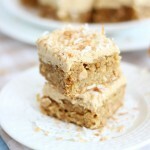 There’s always so many other peanut butter recipes I want to try. 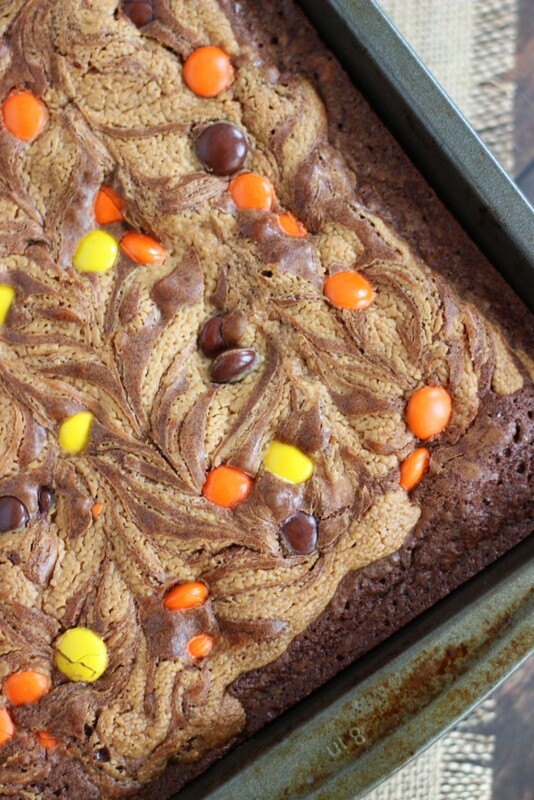 I finally made a version of peanut butter swirled brownies, and they could not be easier or more delicious. 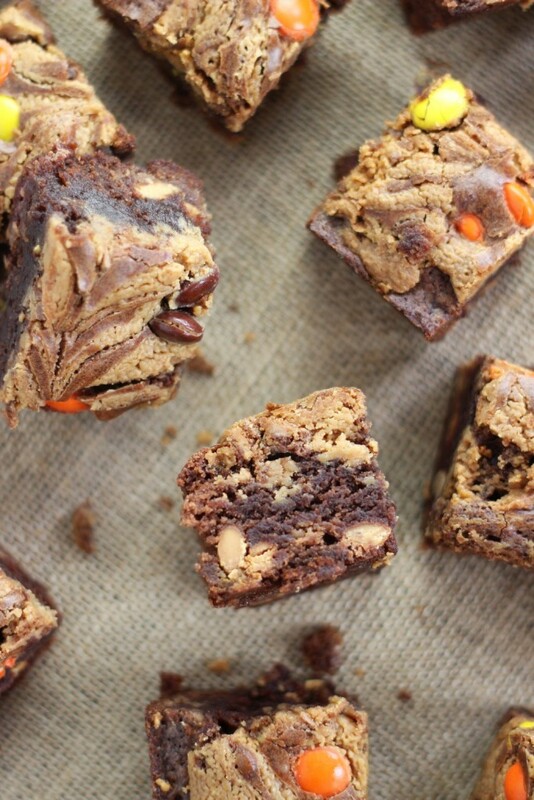 What makes these more impressive than other peanut butter swirled brownie recipes you’ve probably seen before is that these brownies have TWO layers of peanut butter swirl. 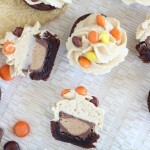 It’s not just a swirl on top, but there’s also a hefty layer of peanut butter filling in the middle of the brownies too. So proud of that decision. A simple idea, but a good one, nonetheless. Typically, swirl brownies are just the top layer, but I strongly felt that one layer of peanut butter wasn’t going to be enough peanut butter for me. The brownies are doctored-up box mix brownies. With a little bit of help, they are fudgy and delicious. 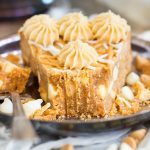 The filling and topping are just butter, powdered sugar, vanilla, and of course, peanut butter. 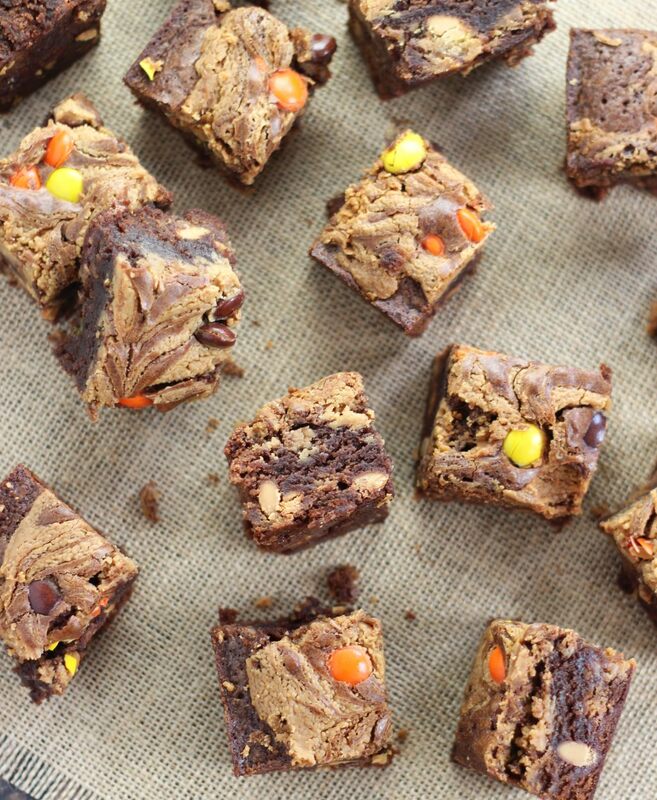 It’s like the homemade version of the filling of Reese’s Peanut Butter Cups or Buckeyes. Perfectly sweet and buttery, and full of peanut butter flavor. 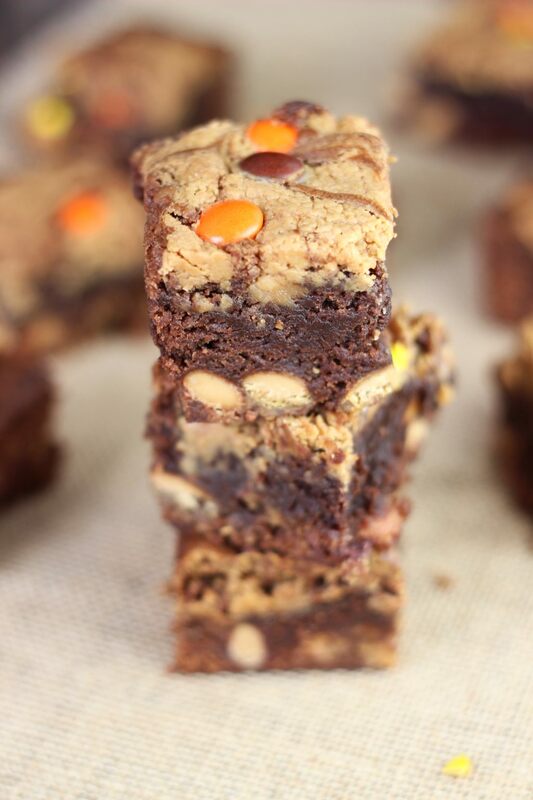 Each layer of peanut butter swirl is also sprinkled with Reese’s Pieces for a little color, crunch, and more peanut butter flavor, of course! 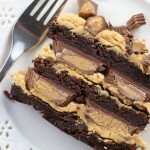 Did I mention how thick these Peanut Butter Swirled Brownies are? They are mile high! Almost twice as thick as a regular brownie. 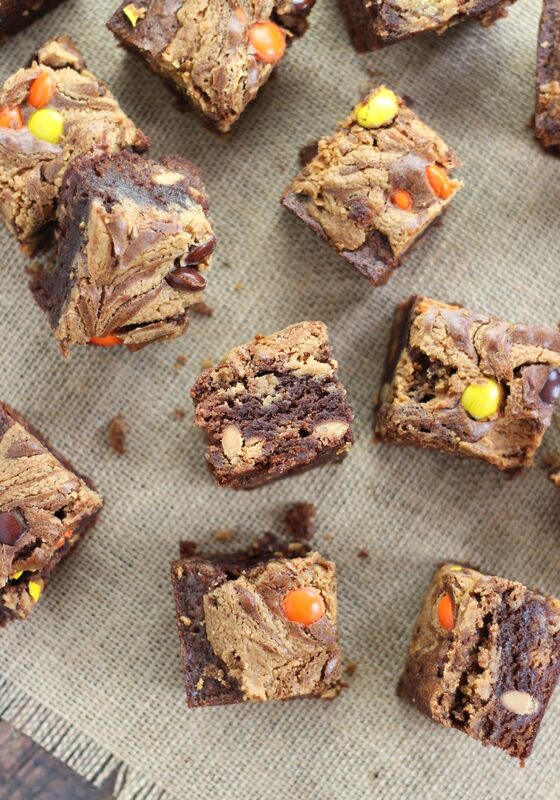 The baking time is much longer, but these brownies are totally worth the wait! 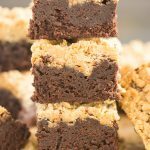 These pretty brownies are so simple to make, and feature a classic favorite pairing of chocolate and peanut butter. 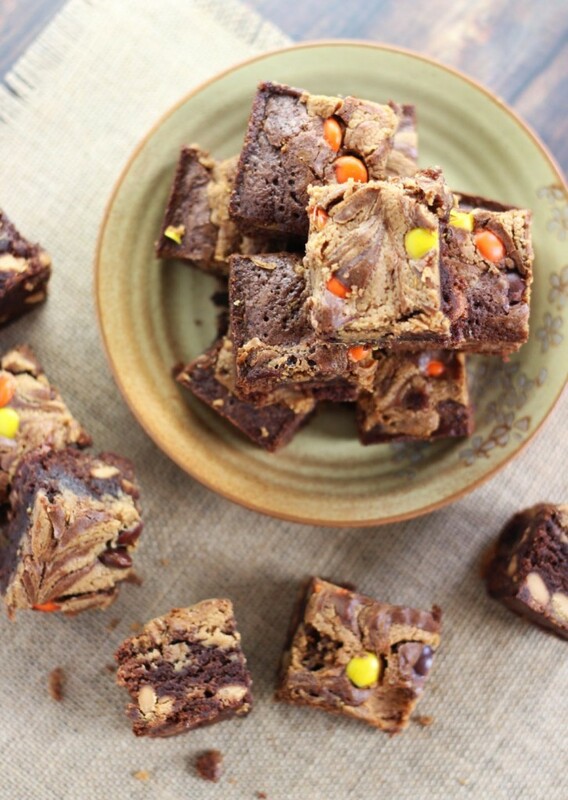 With layers of fudgy, rich brownie, and layers of sweetened peanut butter, this Peanut Butter Swirled Brownies recipe is sure to be a hit! These look delicious! 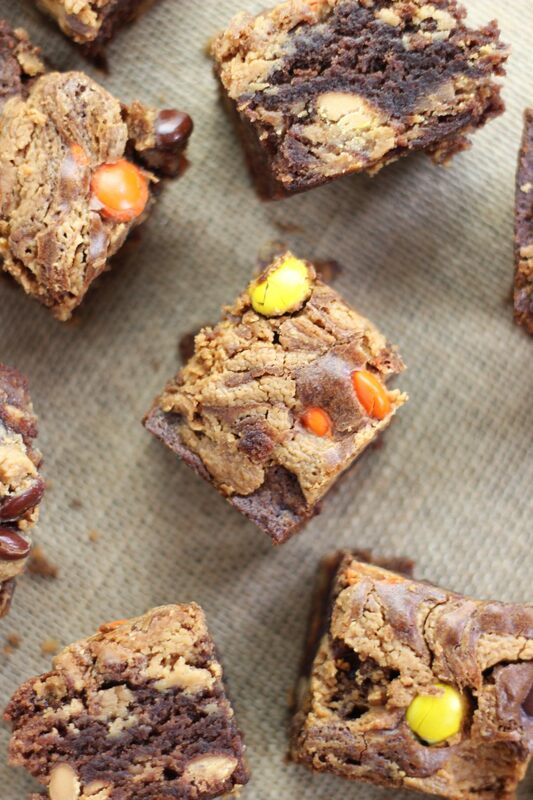 Love the Reese’s pieces in here for even more PB crunch factor! These look amazing and your photography is beautiful!! I just wanted to drop a note and invite you to come join us at Sunday’s Simple Homemaker Link-Up. Would love to have you link-up! !